Buttons and stickers pushing people to think about renewable energy sit scattered out on a table during Wednesday a forum sponsored by the Breckenridge for 100 Percent Renewable Energy Campaign Committee at the Summit County South Branch Library in Breckenridge. Chairwoman of the campaign Beth Groundwater said she was sparked to get more involved in the clean-energy campaign and other environmental initiatives after Donald Trump won the November election. As U.S. President Donald Trump seeks to undo federal climate-change controls put in place by the previous administration, his efforts haven’t gone unnoticed in Summit County. But the local response might not be what the president intended, as Summit County’s environmental groups are benefiting from added interest and increased donations, while town leaders and big businesses are publically taking aim at the shift in federal policy. 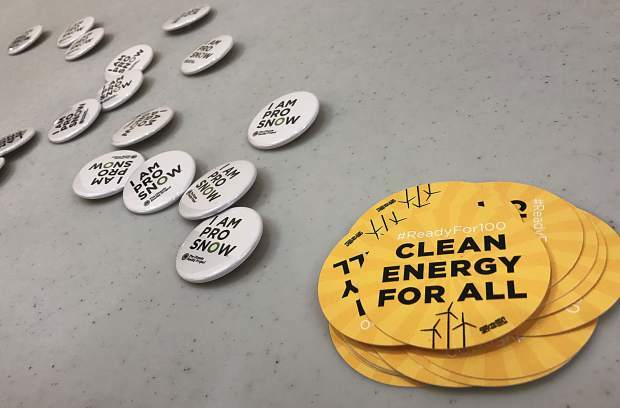 “What I see is a lot more is going on locally because of what is happening at the national level,” said Beth Groundwater, chairwoman for the Breckenridge for 100 Percent Renewable Energy Campaign Committee. Groundwater organized a panel discussion Wednesday in Breckenridge to help local businesses learn how they could become more energy efficient, and afterward she answered questions about the president’s efforts to roll back federal climate-control initiatives and the effect those efforts have had locally. “A lot of people have jumped onto the renewable-energy movement, the climate-change-mitigation movement, recycling, environmental issues in general because we’ve seen a shift at the federal level,” Groundwater said, adding that she is, in fact, one of those people. And Groundwater isn’t alone in her efforts with Breckenridge Mayor Eric Mamula recently joining 278 other mayors across the country in an open-ended pledge to honor the U.S. commitments agreed upon in the Paris Agreement. The Paris Agreement allows countries to set their own goals to reduce their greenhouse gas emissions in the coming years, and it was ratified by the Obama administration and almost every other country in the world in 2015 and 2016. Announcing the U.S. is pulling out of the agreement last week from the White House Rose Garden, Trump argued that it would unfairly burden U.S. workers and hamstring the American economy without demanding enough from other countries. In response, the open letter signed by almost 300 U.S. mayors could be described as anything from defiant to outright confrontational. It states that individual cities will continue to purse climate goals set forth in the agreement, even without the federal government on board. “We will intensify efforts to meet each of our cities’ current climate goals, push for new action to meet the 1.5 degrees Celsius target, and work together to create a 21st century clean energy economy,” states the letter. In addition to Mamula, Colorado mayors in Aspen, Boulder, Edgewater, Fort Collins, Lafayette, Longmont, Telluride, Vail and Denver also lent their names to the document. “We will continue to lead,” the letter explains. “We are increasing investments in renewable energy and energy efficiency. We will buy and create more demand for electric cars and trucks. We will increase our efforts to cut greenhouse gas emissions, create a clean energy economy, and stand for environmental justice. And if the President wants to break the promises made to our allies enshrined in the historic Paris Agreement, we’ll build and strengthen relationships around the world to protect the planet from devastating climate risks. Workers at Summit County’s most active environmental group, the High Country Conservation Center, are also seeing a spike in local interest concerning environmental issues since the election, especially in terms of individual and new donors. “Generally speaking, yes (there has been a renewed interest in local environmental programs),” said Jess Hoover, programs manager at HC3, adding that the nonprofit environmental group received roughly $10,000 more during its annual giving campaign last winter than the group has in years past. In many ways, Summit County is an environmentally conscious place. In Breckenridge, a 10 cent fee is imposed on every plastic bag that goes out the doors of grocery stores, waterfountains have slots for personal bottles and at the annual State of the Town address, many of the questions posed by citizens centered on the environment, such as what the city is doing to limit the use of disposable plastic water bottles and how the city might protect bees from weed sprays.